Railway tracks of Hankai Tetsudo winding through southern Osaka. 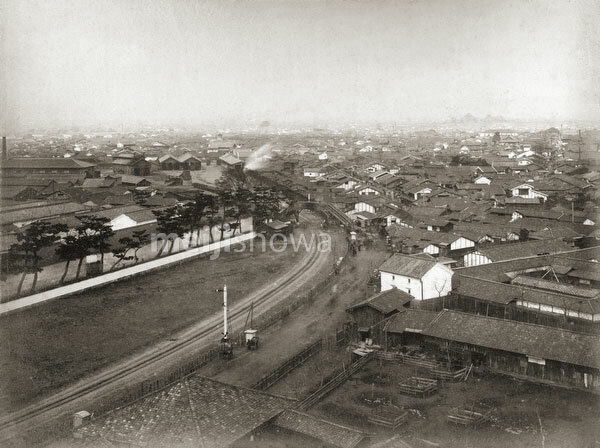 Started in 1885 (Meiji 18), the railroad connected Osaka with Sakai. In 1898 (Meiji 22) the company merged with Nankai Railway; it is now known as Nankai Electric Railway. Below the overpass, the railroad crossing can be seen. At this time, trains still stopped at crossings. Beyond the overpass is Nanba Railway Station. Shot between 1886 and 1890.